In a kadai put the Ellu and dry fry till it starts crackling. Remove and cool. Put it in a mixie and grind it just for two to three rounds. Then add powdered jaggery and again grind it for few seconds. Finally add cardamom powder and again run the mixie for one to two rounds. Remove and make a small lemon size balls. If you use white til seeds, reduce the quantity of jaggety to 1/2 cup and make this Urundai. It will be light brown in colour. It is a quick Prasad normally prepared for Vinayaka Chathurti/Krishna Jayanthi Festivals. Will this Urundai stay for days when preserved? Yes. It will stay good for a week or so. Hi…very delicious and simple dish…i love it.. I tried this Ellu Urundai and it came really good. I added 1/4 cup fried peanuts to reduce the bitterness of Ellu. Thanks. It is a good idea to add peanuts. Also some people add fried coconut gratings to this Laddu. where can i get jaggery powder? The jaggery powder mentioned in my recipes are only the “whole jaggery” which I crush and powder it. 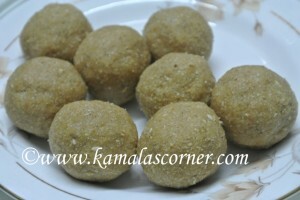 You can buy the round brown colour jaggery or the small one “Acchu Vellam” sold in shops. We also get powdered jaggery which is called “Naatu sarkarai”. But it is used mostly with Aval/Pottukadalai mixture. 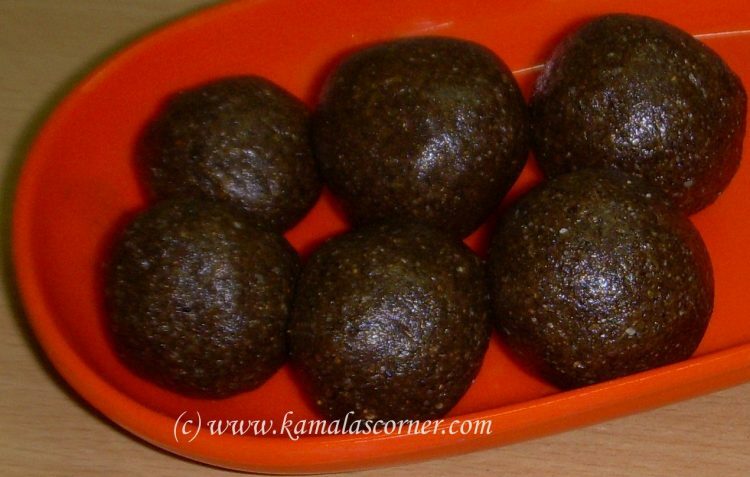 Jaggery typically has sand/mud – how to remove that for this receipe? Pure Jaggery doesn’t have sand or mud. If the Jaggery is in White, then there could be. but white jaggery is not pure Jaggery. Jaggery original color is choclate or dark brown. the lighter the color the lower the quality. Could you replace jaggery powder with equal amounts of sugar? Yes. You can replace with sugar. However the taste will differ. To make Ellu Urundai with vella pagu, instead of grinding jaggery, add little water to the jaggery and make thick vella pagu. Before removing from stove, add Ellu Podi (dry roast and powder as above), mix well and allow to cool. Then make Ellu Urundai.